When Walt ’68 and Kathy Snodell are asked where they’re each from, they laugh first. Then they explain. Walt is from the south side of Chicago. He’s a White Sox fan. Kathy is from the north side of Chicago…and a Cubs fan. Though their baseball loyalties have caused a few disagreements over the years, they both love their city, believe in all-male education, and want more students in and around Chicago to hear about Wabash College. In order to help the College with recruitment and enrollment efforts in their hometown, the Snodells recently gave $4 million to start the Greater Chicagoland Initiative. The Snodells’ initiative focuses on four components: scholarships, a Chicago-based Admissions counselor, marketing, and support for recruitment events outreach for students in Chicago and its suburbs, southern Wisconsin, and eastern Iowa. Walt, chairman and CEO of Peerless Industries, Inc. and chair of Wabash’s Budget and Finance Committee, said his and Kathy’s thought process behind the Greater Chicagoland Initiative was to help develop and maintain an international footprint for the College. One reason recruiting Indiana students is easier than out-of-state students is because of state grants that are available to Hoosier students. Walt and Kathy are helping make up that difference in the Chicagoland area with the “Snodell Scholars.” Seven students from this year’s freshman class make up the first group. Samue l Pipiras ’22 is from New Lenox, Illinois, and is a member of the football team and Beta Theta Phi. 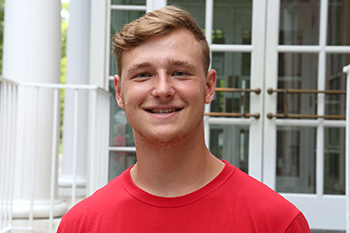 After his first semester at Wabash, he said he has already learned valuable lessons in time management and dedication. When the Snodells heard what Pipiras said about their generosity, they said it was the essence of why they gave. Part of the Snodells gift also provides funding for Associate Director of Regional Admissions Kyle Vowell, the College’s new Chicago-based Admissions counselor. Vowell said many of the high schools he’s visited hadn’t heard about Wabash College before but are always impressed after learning more. He has already been able to visit more high schools, meet with more prospective students, and connect with more high school counselors than the College had been able to in past recruiting efforts. 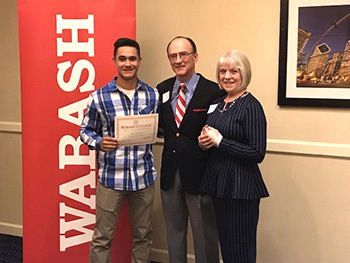 The Giant Steps Campaign is a $225 million comprehensive campaign focused largely on growing Wabash’s endowment for scholarships, faculty, academic programs, and cross-cultural immersion learning experiences.